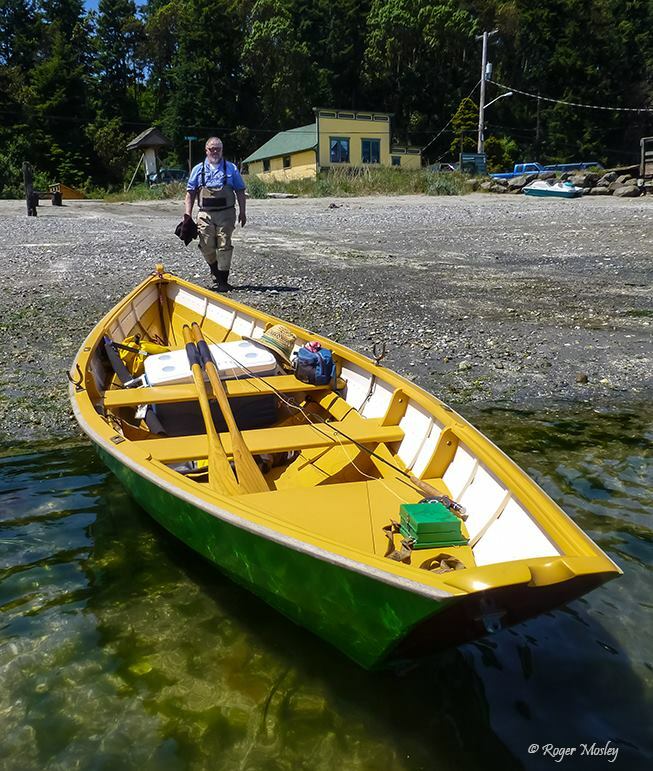 washington fly fishing: Beach Bugs- "You can't catch sea-runs on dry flies"
Beach Bugs- "You can't catch sea-runs on dry flies"
"They said it couldn't be done. It was a tough job, and he knew it. and by God, he couldn't do it!" "You can't catch sea-runs on dry flies"
"Don't be ridiculous, you can't catch sea-runs in the saltwater on dry flies." "When are they going to jump up into the air, like you said they would?" "This is my last cast!" And then, as they are winding in the fly and line, a fish will slam the fly. This is especially rewarding if they have not caught anything all day. Stuff like that. Just as I was trying to come up with an answer to this boy's perfectly reasonable question, a big trout jumps up out of the water and cartwheels through the air, about fifteen feet in front of the boy. He was astonished. (So was I. But I did also feel a sense of relief as this burden of credibility had so conveniently been lifted from me in the moment.) Now this boy was a beginner and he couldn't cast much more than that short distance anyway. 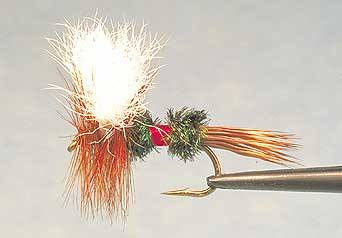 And to help him see the fly more easily I had tied on a Muddler Minnow for most of the day. But he had beaten most of the Muddlers that I had tied on for him into the rocks and shells and barnacles, on the beach behind him, all day. And I was out of Muddlers by the afternoon. So I had tied on a nice, fluffy #12 Royal Wulff fly, and greased it up to float. Because you just never know. And they are trout, after all. And trout eat bugs. I told him to try to drop the fly right where the fish had just jumped. And he did just that. Perfectly. There was a slow swirl around the fly, and a flash of silver and spray of water, as the big trout crashed down on the fly. Boom! And the game was on. It took a minute or so for the boy to get it together, with a little coaching, and he got the fish into shallow water. I got the fish off of the hook, and we had a moment to look at a bright, strong, wild sea-run cutthroat that was every bit of 18 inches or more. I let the trout slide of of my hand and swim away. We were breathless. "Hey, that's a huuuuuge cutthroat!!" "What did you get him on?!" "A number 12 Royal Wulff." "Don't be ridiculous! You can't catch sea-runs on a dry fly in saltwater!" "What did you get him on?" 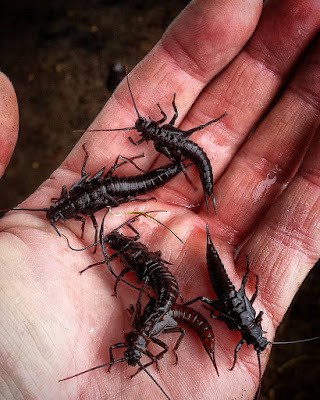 He pulled his fly box out of his vest, (only tourist visitors wear a fly fishing vest on the beaches here), and he opened it up to reveal a few dozen black and yellow Kaufmann's Stone Fly nymphs. "They're taking the yellow ones today." He was holding one up for me to look at, and it was still dripping wet, tied to the tippet. Who was I to argue with this? Black Giant Stoneflies. Real ones! "Watch out for the experts . . .
An ex is a has-been, and a spurt is just a drip under pressure"